I'm interested in all things 17th century Ireland and one if those things is architecture. The 17th century in Ireland was, in my opinion, the most important century is Irish history. Unfortunately schools don't see this but they'll get it at some point! I've been working in the heritage sector for well over 10 years and six of those have been with the National Trust in Northern Ireland. I work in caring for historic collections within a 17th century Irish house and I suppose this has to contribute to my love for buildings from the period. This site will help the viewer to search through the 17th century Irish houses I've collated from many sources. However, it will be an ongoing process and when I'm finished I believe it will be the best and easiest platform to find houses from the period. Like all indigenous people around the world, the Gaelic clans around Ireland would have been hailed as conservationists considering current mentality in the caring for our natural environment. That said, the forests of Ireland at the beginning of the 17C covered 1/8 of the land mass of Ireland. The above fraction sounds insignificant, but the island of Ireland had many uninhabitable areas and landscape that couldn’t sustain any growth at all such as bog terrain, mountainous regions, karst lands and estuaries. Therefore, the relative size of woodland cover in Ireland at this time was high. Leinster, the first province of Ireland to be colonised by the English in the late 12th century was slowly deforested over the following few centuries although County Wicklow, areas of Carlow, Wexford and Laois still had substantial pockets of woodland by 1600. The lower Suir Valley had the Great Wood of Kilconish, north of Enniscorthy had the Wood of Coillaughtim and the Shillelagh in County Wicklow all need to be mentioned within the Leinster area by 1600. Munster which was well-settled by Anglo-Irish and New English by 1600 was still a very densely wooded area. Munster in many parts was above 1,000 metres leaving many valleys enjoying the privacy from human contact and industry because of limited access. The great forests of Munster were well known in Tudor times. Forests such as Glanekinty north of Tralee and the woods around the Killarney region were particularly dense with native trees. Connaught is and was a province that varies in landscape because of the bogs, mountainous areas and land with poor soil. However, by 1600 Connaught still held on to some forested areas such as the Forests of Leguy and Fasach-Coille near Lough Allen in Roscommon. A dense wood on the Galway-Clare border called the Wood of Suidain near Lough Derg also existed. The final province to look at was the last place to be colonised by the English/Scots. Ulster was heavily forested after Hugh O’Neill and his allies were defeated by Mountjoy’s forces in Kinsale after the Nine Year’s War. That said, the east side of County Down was for centuries occupied by Scottish settlers that lived in reasonable harmony with the native Irish. Forests such as the Glens of Antrim, Killultagh, Dufferin, McCartan’s Country, Glenconkeyne, Killetra and Mountreivelin all sat side-by-side with Ulster Gaelic folklore and survived until new English and Scottish settlers became intently dedicated to new industry which relied on timber as a fuel and resource. Before we move towards the causes of deforestation in Ireland after 1600 it is important to understand some contemporary thoughts from foreign invaders and how they saw the Irish woodland. By 1603 the Nine Years War was over and wherever the war-weary troops of both sides passed through, they paid havoc to the lands and resources around them. New settlers would look at the woodlands as a haven for woodkerne[i] and renegades. As early as the late 14C, Richard II feared the woods of Ireland when he landed on the east coast in an attempt to subjugate the Irish. He, alongside future Viceroys of Ireland toyed with the idea of cutting down vast swathes of forest to make a profit but also to secure the provinces from Irish renegades. Not only did the victory of the Nine Year’s War for the crown see the final Gaelic power in Ireland diminish it also opening the floodgates for the incredible resources available to the business-minded settlers such as Lord Chicester, Thomas Philips and Lord Mountjoy. New planters at the start of the century also toyed with the idea of cutting down all Ulster’s forests. Blennerhasset, an early planter described the wolf and the woodkerne as the most serious dangers to the colonists in Ulster. He continued by saying ‘no doubt, it will be a pleasant hunt and much prey will fall to the followers’. The wolf finally died off in 1770 but the settlers in Ireland enjoyed the chase moreso against the woodkerne and the last were dragged from hiding at the beginning of the 18C. Ironically, but not directly related, the woodkerne disappeared alongside the wild forests of Ireland. From the beginning of the 17C exports in Irish timber increased. By 1625 the French and Spanish casked all their wine from Irish wood. The London Companies that managed much of the escheated lands of Ulster early in the Ulster plantation enticed many settlers from England that much profit can be made from the ancient woods. Their written word persuading prospecting settlers to Ulster in 1620 and stressed, ‘All sorts of wood do afford many services for pipestaves, hogshead staves, barrel staves, wainscot…[ii] (staves being the constituent parts that make up barrels). Although the 17C cannot be entirely to blame for denuding the island of Ireland of its forests but it can be prime suspect for corralling it in the wrong direction. A ‘free for all’ may be too strong a way to describe it but it can’t be far off as a description. The main industries that made Irish timber top the lists of exports were iron making, stave making (barrel making), house building, shipbuilding, tanning and glass making. Out the above list it was iron making and glass making that used the forests as fuel. The forests of Munster filled the insatiable furnaces of the White, Raleigh, Boyle and Petty dynasties. Great profits could be made from the untouched forests away from the beaten track in Kerry and Cork. The greatest cost for the fuelling of the iron works was not the purchasing of the timber to burn but the transport of it across badly negotiable tracks where there were no tracks before. William Petty is said to have invented a single-wheel carriage to get him through the roads of Kerry to his Kenmare estate. Even in 1812, an Edward Wakefield mentioned the travelling through Kerry as a ‘place which is seldom visited by travellers, as there are no roads to it of any kind’. [iii] This is the reason iron works sometimes moved when tracks of forest were used up and works sprang up in the most rural of places as they continued to follow the fuel. The valleys of Roaring Water, Bantry, Coomhola and Glengarriff were denuded of oak which fuelled the iron works. Bantry itself became an industrious town at the start of the 17C because of with iron smelting but more famously the tanning industry which we will talk about below put it on the map. It wasn’t until the end of the 18C that techniques using coal as a fuel for iron working was underway. Apparently, the best charcoal for the smelting of iron is 25 year-old coppiced oak. There is also a calculation that an acre of coppiced wood gave enough fuel to make a ton of iron. [iv]There may have been up to 200 iron works working at any one time in Ireland and their distribution was relatively even throughout the island. Each forge would have been in operation close to the fuel source and some would have only opened for a half of the year depending on the availability of fuel. That said there were quite a number of iron works in production for well over 100 years with the Enniscorthy (close to the Wicklow forests) forge blowing hot air for an amazing 232 years. Without a doubt iron working put paid to many of the ancient forests of Ireland but the forests were managed to a degree in order to support the running of furnaces throughout the 18C. The vast majority of works began in the early 1600’s and once the fuel source diminished a somewhat after 1700 they were all closed up by 1800 or they moved to coal as a fuel type. Another industry that used Irish trees as a fuel was glass making. Glassworks were introduced to Ireland in 1588 by Lord Burleigh because ‘the woods in England will be thereby preserved and the superfluous woods in Ireland wasted’. [v] Glassmaking didn’t have as much of an impact on Irish forests as iron working and from the 1670’s the glassworks moved from inland to coastal settlements as the process could be completed using imported and native coal. Tanning, a process essential for the leather industry was extant in Ireland long before 1600. However, after the plantations of Ireland (c. 1580-1630) its production began to pick up speed. It is usually the bark of a broad-leafed tree, preferably an oak, that is used in the process. A competent person could strip a tree in two hours and during the Spring time it was best for felling because this was the best time for stripping the bark. Tannin, an acidic chemical compound found in the bark of oak or fir trees is used in the tanning process to prepare leather. Tanners were not much liked by other industries using trees to line their pockets. Tanners can strip a wood in a matter of days and acomment made by a Peter Brousden who worked for the British Navy in the 17C in search for good trees to fell for shipbuilding said, ‘Sir William Petty’s woods in Kenmare were in better shape than most other woods because of the absence of brogue-makers in the district’. Brogue makers were shoe makers and therefore made of leather. Sir Thomas Philips, Ulster’s opportunist and financial adventurer, mentioned that he thought tanners were lurking in every wood although they appear to have been scarce in Ulster compared to other provinces in the early 17C but a little paranoia kept him on his toes! Unlike iron working, tanning continued to be a financially successful industry even though exports of timber in the early decades of the 1700’s went from exporting timber to importing timber when the Scandinavian fir trees replaced the Irish oak. The number of tanneries rose in Dublin from 36 in 1768 to 45 in 1800. Other industries like house building had a significant affect on the forests of Ireland. House building increased tenfold to accommodate the new English and Scottish settlers that were given land as payment after the Desmond and O’Neill rebellions were put down. The half-timbered English style houses sprang up in every town and along the landscape of rural areas during the early years of the plantation. James I put a demand to the English and Scottish settlers that they should build to a standard. The Undertakers (settlers given 2,000 acres or more) were contracted to build and establish communities that would support each other for the survival of these new settlements. House frames fabricated in the English style in plantation Ulster became a middle-sized business and the Ulster forests of Glenconkeyne and Killetra were used to bare the weight of production. The City of London who owned thousands of acres in Ulster tried entice the English to come and settle with the promise of Irish oak to build their properties but by the 1660’s imports of softwood were steadily being requested especially in timber-hungry cities such as Dublin. Finally, another industry that sprung up in Ireland during the 17C that affected the native forests as a resource was shipbuilding. Normally under 100 tons, Irish ships built in the 17C were generally small. Because of the unchartered estuaries and coastlines around Ireland, in 1618 the navy commissioners advised against any large ships drawing more than 16 feet of water. This means the depth of water the ship submerges to when afloat. In 1611 on the Cork coast, nearly 30,000 trees were earmarked by the navy for shipbuilding. All of the timber the navy were interested in was within ten miles of the coast or navigable rivers due to the high cost of transport. In 1621, the English Act supporting the English Navy prohibited any felling of trees close to the coast, but this was never implemented. [vi] The life of a ship was quite short and twenty years would see a ship go to retirement. The forests of Ireland were a commodity to the English and Scottish planters. The 17C settlers and the Gaelic Irish minority that moved with the changes in society saw timber as a means to an end and the resource was more precious than one would think today. With the influx of settlers so too was the need for farm land. The depletion of the Irish woods began centuries before 1600 but the socio-political turn around after the Nine Years War from 1603 onwards saw a hunger never witnessed before to use Irish resources to the point of elimination. Towards the end of the 17C Irish timber became scarcer and landlords became stricter in what their tenants could take for themselves. An early example of this on the Rawdon estate was the detail in a lease of 1653 where tenants could only cut wood on their land with the permission of the landlord. Parliament passed acts from 1689 to 1791 to conserve existing broad-leafed trees and to enforce planting. To replace the diminished Irish timber, pines were planted and imported. With rarely little replanting, the landscape of Ireland changed for the first time since the last Ice Age. Today, Irish woods cover 1% of land cover. This statistic is a sad one as the majority of the timber planted in Ireland is Scot’s Pine and other types of quick growing trees and they are bound for the market for selling after 30 years of growth. Although An Coillte (Forestry Service of Ireland) employ many people there needs to be a rethink as to how we see the future of Irish forestry. Scot’s Pine was re-introduced to Ireland after centuries of extinction by Cromwellian settlers during the middle of the 17C. Native Irish trees that flourished since the last Ice Age were oak, ash, birch, hazel, whitebeam, holly, willow, alder and juniper to name a few. Interestingly, a number of broad-leafed trees that sound very familiar such as horse chestnut, sycamore and beech were introduced in recent centuries. An Coillte earned 287.7 million euro in revenue in 2016. The landscape of Ireland is generally bare of trees and the random rectangular shapes of conifers on hillsides don’t particularly look pleasing to the eye. A future strategy for An Coillte could be to plant native Irish trees around the country to the levels of pre-Cromwellian times. Agreed, broad-leafed trees take much longer to grow and this generation may not reap the fruits of what we grow. That’s why it should be regarded as a long-term plan. There are many thousands of hectares in Ireland that are unused and underdeveloped. The financial gain will not come from felling the trees after 100 years but to open up forest trails and activities for future generations to enjoy. There can be many break-away financial opportunities to capture the visitor numbers using the forests. An Coillte shouldn’t lose any revenue as they can continue to fell conifers each year and it is the planting of broad-leafed trees that will incur the initial cost. Could this cost be siphoned from another sector? Could there be a national charity push to finance the planting? Could volunteers give some of their time to help with the planting? A national drive? It has been proven that volunteering has had a positive effect on the mental wellbeing of the person volunteering. That said, a replanted deciduous Ireland will have an incredible surge of interest from the nation. In a time where children are more inclined to embrace digital software and stay under roof it would be less complicated if we could give people more reason to venture outside to an oak and yew forest much like those that Gaelic Irish clanships passed through on a day to day basis. Currently, the Irish government plant coniferous trees to use in the energy industry such as biomass to power private and industrious boilers. They give grants to farmers to grow trees which is nearly all coniferous to use as fuel. In 2017 a report was published by T.D Andrew Doyle, Minister of State who is responsible for forestry in Ireland. The report seemed very positive and it revealed that ‘Irish forestry cover was at its highest level for the last 350 years and that over one quarter of our forest estate contains broadleaves’. There has been a concerted effort to develop Irish forests but the main reason to do this is for short-term financial benefits. A much more beneficial approach would be a long-term strategy to plant broad-leafed trees to survive until mature. A slight shift towards tourism and recreation as opposed to short-term finance from the government and a public outcry to show ambition to change the look of our country and there is every chance a change could prove beneficial to the lives of future generations of Irish people and the millions of tourists to the country. [i] Gaelic Irish disaffected from defeated battles against the English. They would use the woods as hideouts and pounce similar to highwaymen in England & Scotland. [ii] McCracken, Eileen,; The Irish Woods Since Tudor Times, pg. 98. [iii] Architecture 1600 – 2000, Vol IV, pg. 145. [iv] McCracken, Eileen,; The Irish Woods Since Tudor Times, pg. 92. [vi] Carew, MSS, 1603-24, pg.194. Set on high ground overlooking the winding Belgooly River and Oyster Haven, the ivy-covered Mountlong Castle makes a picturesque impression in the lush rural landscape, epitomising the romantic vista anticipated by the tourist visiting Ireland who expects to see an abundance of castles and to hear tales of ancient mythology. Mountlong Castle, begun in 1631 by John Long, is a fine example of a new building type emerging in the early seventeenth century: the fortified house. An earlier type, the defensive towerhouse, dominated from the early 1400s until the 1640s. Seventeenth-century builders owed a debt to the numerous towerhouses scattered across the country and superimposed onto their basic form new architectural features introduced by English settlers. Mountlong Castle exemplifies the new style. Its proportions and detailing, including large mullioned windows, mark the transition from dimly-lit towerhouses with an overt defensive capability to properties boasting comfortable well-lit rooms and a modicum of fortification. One reason for being less preoccupied with defence was that this corner of Ireland was, for the most part, subdued by the English following the Munster Plantation. A new authority ruling the land, and less inter-tribal conflict between Gaelic lords, brought about a brief period of comparative political stability. In lieu of defence, builders could turn their attentions to aesthetics and functionality. Mountlong Castle boasts a flanker or tower on each of the four corners of the central tower. These are features shared in common with the contemporary Monkstown Castle (1636) and, originating in English architecture, may have been intended to supplement living accommodation. 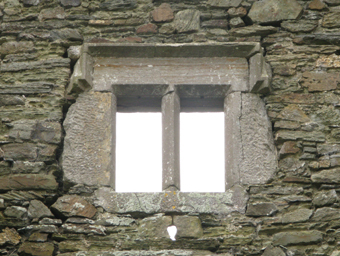 The mullioned windows, given chamfered frames and simple hood mouldings, were clearly not intended for defensive purposes. Nevertheless, gun loops covering most angles allowed a measure of protection against any potential enemies. Another feature borrowed from English architecture was the gable-ended attic space and it quickly became the custom to use the “garrets” as accommodations for servants. Unlike the earlier towerhouses, where the household might share the same cramped quarters, the new houses saw the separation of the family and their servants into specially designated areas of the building. In accommodating the servants in quarters “out of sight”, houses such as Mountlong Castle set the precedent for the “upstairs downstairs” way of living that continued through the subsequent Georgian and Victorian periods. In its ruined state it is difficult to decipher the exact function of the rooms on each of the three tiers of Mountlong Castle, however, it is reasonable to speculate that the ground floor was given over to the kitchens and ovens. The living accommodation overhead gives an insight into how much value was placed on aesthetics and, writing in 1907, J.F. Fuller describes cornices ‘with figures representing scriptural subjects and fieldsports’. No fireplaces survive in the main block but chimneys in the corner towers suggest that at least those rooms were well heated. Unfortunately for its builder, the glory days of Mountlong Castle were brief. In 1641 a rebellion broke out in Ulster which quickly spread across the whole of Ireland. John sided with the Catholic rebels in a conflict that has since been known as a war between Catholic natives and Protestant settlers. John and his sons set up camp on top of a hill near Belgooly but the following April saw the defeat of the rebels near Bandon. It was the beginning of the end for the Long family and John was convicted of treason and hanged alongside many of his fellow rebels. Legend tells us that, aware that he would ultimately be captured and executed, John instructed a relative – some sources say his daughter and others his sister – to burn Mountlong Castle in order to prevent the Cromwellian army from using it for their own purposes. Remarkably, some timbers, including lintels over door and window openings, still carry scorch marks to this day! Outside of the academic environment, identification of 17th century Irish houses is something ambiguous and confusing to most. Even the well-informed individual may stumble to identify the timeline of an 18th century ‘Georgian’ style house because it can sometimes sit firmly within the 17th century. All styles of architecture have borrowed from each other but it was the 17th century that truly saw birth of the house as we know it. I am not an academic (anymore) and I will try to make some sense of the plethora of styles between 1600 and 1700 in Ireland. Academic papers usually select dates between 1550 to 1740 in order to integrate architectural styles as a ‘period’. However, without much explanation I’m going to start at 1600AD, I’ll give a nod to some architectural gems from the 16th century to start with and finish at 1700AD. Munster must be acknowledged as arguably the most prosperous province for early 17th century buildings. One house in particular that is a rare survivor from the mid-1500’s is Myrtle Grove. The building is characterised by the steep gables and oriel windows. This building is a gem of Irish architecture and it must be one of the earliest unfortified houses on the island. The house is well known for being associated with the famous soldier and explorer Walter Raleigh. Part of Myrtle Grove folklore has Raleigh planting the first Irish potatoes in his garden and the first to smoke tobacco on Irish soil. Both coming from South America. Raleigh acquired his 42,000 acres of Munster land after the defeat of the earl of Desmond in the 1580’s. 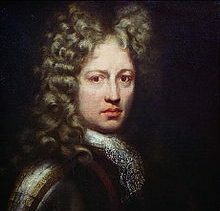 The earl of Desmond owned a little less than 300,000 acres and in the aftermath of his defeat the redistribution of his land was dubbed the Munster Plantation. Another ‘Gold Standard’ building that is a Tudor survivor is the Tipperary Ormonde Manor House. It was built in the mid 1560’s and as you can see from the photo there are gables galore! The gabled features were something that would have been very rare in Irish architecture at the time and it was influenced from English architecture. It was the home of Thomas Butler, the 3rd Earl of Ormonde. Butler was closely tied to the English monarchy and he spent much of his time at the English Court. It was there he brought back his ideas to start on one of Ireland’s rare surviving (and still standing!) manor house. If fact, this great house was a Long Gallery or Long House. Popularised by Cardinal Wolsey in the 1520’s, Long Galleries were used for exercise and entertain. Internally, the building has the bragging rights for the earliest known renaissance-style plasterwork in Ireland and the space was heated by two Italianate fireplaces. The building is owned by the OPW and is open to see seasonally. The 17th century architecture chapter in any book in the library will be a quick read and will reluctantly be the supporting actor to the elegant-natured 18th century Classic style that may fill a couple of chapters. One of the reasons architecture in 17th century Ireland is not studied and admired as much as the latter period is because of its lack of abundance and mainly because it was stymied in its innovation by war, rebellion and famine and its lasting footprint is meagre in comparison to the following century. Ireland was also an unstable English colony and change by foreign influence could be met by fierce Gaelic reprisal if the status quo was adjusted. Gaelic Ireland was still a force to be reckoned with and vast swathes of lands were under Gaelic influence for the first 40 to 50 years of the century. For those of you that might believe Ireland was run by the English from the 12th century on will find that reading the correct research, you will quickly understand the majority of the country was in Gaelic hands. However, by the mid 1500’s proprietorship of Irish lands began to change slowly with the coming of English plantation projects beginning in the midlands, then Munster and finally Ulster. This eventually saw the English move closer and closer to complete occupation as the whitened knuckles of the English-grip relentlessly squeezed to breaking point for Gaelic Ireland and by the 1620’s the country was firmly governed by the colonists. The most ubiquitous of all structures in Ireland at the turn of the 17th century was the Tower House. A tall rectangular structure that was fortified and normally home to a lesser or middle-sized Lord. The Tower House has its origins in Ireland in the early 15th century and there are over 2,000 still standing in Ireland. However, there are Tower Houses in Scotland and Wales and their influence and style may have also come from a scaled-down Norman castle or even from the continent. The photographs below depict two Tower Houses, one in County Down and another in Southern France and Wales. The French building is nearly 200 years older than the Irish building. A. Castle Ward, Co.Down Tower House built by the Ward Family in 1610. B. Chateau d’Arques in the Aude, France built in the 14th century. C. A Tower House in Wales from the late 14th century. It was a fundamental requirement that the Tower House defended against any threats such as forays by neighbouring clansmen or colonists as these encounters were commonplace. Defensive features such as bartizans that were corbelled additions to the corners of Tower Houses with openings called machicolation gave the defender many angles to work with to defend from. Bartizans are commonly featured in Scottish buildings but not uncommon in Irish buildings. 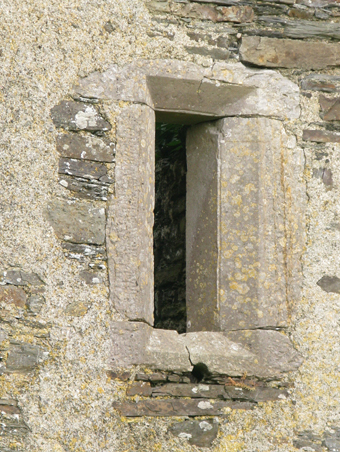 Gun and arrow loops are slits in the masonry of Tower Houses to give occupants a sight for oncoming attackers. Yett gates are also more common in Scotland but at least 20% of Irish Tower Houses were fitted with them (Duncan Berryman 2008). However, although I have indicated that Tower Houses were defensive structures, it has been proven that defence was not always in the mind to an ambitious builder with a view to building a Tower House. Studies at Queen’s University Belfast have shown that Tower Houses were ineffective when up against experienced besieging attackers and the defensibility of Tower Houses has been brought into question. This means that they shouldn’t be ‘pigeon holed’ along with the larger and earlier Anglo-Norman castles. It also raises some interesting questions about the reasons behind the style of building chosen by their owners. Certainly, defence is a reason to build a Tower House but not the primary reason and the defensive ability of such a building was only as a last resort. Therefore, it leaves open a range of other logical reasons to choose the Tower House design as a house and home for a Lord. Future studies in this area may reveal interesting insights into the mind of the builders of these omnipresent structures across the island. By 1643 Ireland had seen the last Tower House built in Derrynahivenny, County Galway. Standing side-by-side with Tower Houses from the 1550’s onwards Ireland saw a different type of building that was in some way related to the Tower House and became known as the fortified house, the Manorial House or castellated house (you choose!). Either way the need for defence was slowly diminishing and this was seen in this new style of building. Kanturk Castle, built for McDonogh McCarthy in 1601 was a Gaelic Lord that took the Gaelic side in the Nine Years War against the crown. Kanturk Castle is a good example of the architectural adjustments made from the single-form Tower Houses to more complex structures. The main additions are the towers or ‘flankers’ (flanking towers!) that create a strong symmetry to the building. Here defensibility is drastically reduced with mullioned windows placed centrally between each string course. Style and a ‘following of fashion’ are now part of the benchmark principles before any foundation stone is placed. An example of this is the boroque door entrance into the castle (right). The flanker plan, possibly seen first in Rathfarnham Castle, Dublin (1583), is featured throughout Ireland and Munster yields the most in this form. Along the Cork coast are examples similar to Kanturk Castle such as Coppinger’s Court (1616) and Monkstown Castle (1636). An interesting feature on Monkstown Castle that is found in later structures (some examples exist from the 16C) in Ireland is the English gabled roof. An exposed gable is not a fortified characteristic. All these can be seen using my maps service on the main page. Monkstown Castle (1636) with gabled roof, bartizans (possibly for show) is a flanker plan. An important note to make at this point is that there is no straight line in trying to explain the architectural history of Ireland in the 17th century. Styles emerged that ran alongside each other and they differed depending on which part of the island you are looking at. However, what can be taken from this chronology is that generally the emergence of less defended buildings as the century went on appeared on the Irish landscape and this depended on how safe it was for prospecting landowners to build and how benign the Gaelic Irish became as a counter force. That said, Gaelic Irish landowners continued to build alongside English and Scottish settlers. One such building phase that became familiar on the Irish landscape was the Leamaneh-Loughmoe type habitations. These buildings showed innovation, prosperity and an adoption of new styles and outside architectural influence never seen before (outside of Myrtle Grove and Ormonde’s Longhouse). Many Tower Houses were extended with a manorial addition that became the lived-in part of a house. These additions were unfortified with multiple fenestration that would illuminate the space. Leamaneh and Loughmoe Castle are examples of this forerunner style. Leamaneh Castle. Manor added to 15th century Tower House. Photo credited to P.L.Chadwick. Leamaneh Castle is an English-style manor house built onto a 15th century Tower House. Built by Conor O’Brien in 1643, the same year as the last Tower House was built 50 miles away, shows how O’Brien was influenced by Jacobean architecture from England at a time when Ireland was in the throws of a rebellion with the English monarchy. There are countless examples of this type of the reusing of Tower Houses as an architectural continuum. 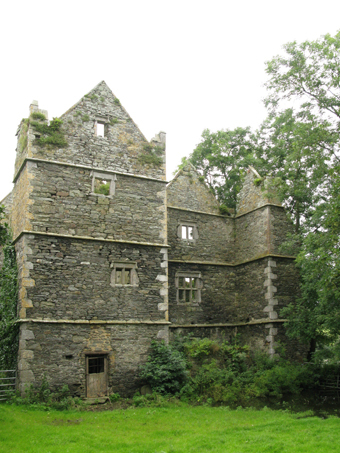 An example of an English soldier, Edward Doddington, in the early years of the Ulster Plantation at Dungiven built a manor house onto the walls of an O’Cahan Tower House. In the 1980’s an archaeological dig unearthed the subterranean part of the Doddington building and concluded the walls of the building were not supported by proper foundations. Thus supporting the theory that the manor house was either quickly erected or the money simply wasn’t there to construct it. By the time Cromwell departed from Ireland in the wake of his Protestant crusade, the country had been left in ruin and many of his soldiers were paid in Irish land. Whether good or bad, the period from the 1660’s to 1700 saw the undefended manorial house prosper as the most common style. The Restoration period in the 1660’s saw some absolute gems being built and one in particular is Eyrecourt House, County Galway which is one of the most important of them all. Eyrecourt Castle (1660’s) with symmetry, dormers, roof-line eaves and a baroque door entrance. Photo credited to Archiseek. Eyrecourt House was one of the first artisan-mannerist houses in Ireland and boasts many features that are rare even in England such as the central bays being slightly recessed and the ground floor staircase. There are many dormers on the sprocketed roof with a pedimented façade and detail only a master-craftsmen could execute. Unfortunately, Eyrecourt House is derelict and falling down. However, the original stairs that are unique in style to Ireland are preserved in a Detroit University. Richhill House, County Armagh is another contemporary example of an undefended building to emerge from the second half of the 17th century. Instead of a square plan like Eyrecourt, Richhill is a U-shaped plan that incorporated genteel detail such as ‘Holborn’ shaped gables which originated as a Flemish design and brought to England in 1610. The projecting wings that make the ‘U’ shape of the building may give a nod to the ‘Flanker’ type buildings forty years before. Maurice Craig, once a leading authority on 17th century Irish architecture comments on how similar Richhill ground plan is to Coppinger’s Court (1616), a flanker type semi-fortified house in County Cork. If this assumption from Craig is accurate it could mean that throughout the century certain styles that were prevalent from the beginning of the century tended to stay on the designers drawing board. These Irish Restoration houses began to appear on the Irish landscape and they indicated many social elements that became its enduring architectural legacy. The fortified building was clearly an historical chapter in how people lived. The 1690’s saw a pause in the building boom as the Williamite Wars struck a blow to the Irish economy once again during the seventeenth century. Not even this most destructive war saw a reappearance of the fortified dwelling. An exquisite example of the continuation in building unfortified houses post-Williamite War is Springhill, County L/Derry. Springhill (1690’s) front and back, near Cookstown, County L/Derry. Springhill, built by the Conyngham Family in the late 1690’s, is a fine example of a building that links architectural styles and the socio-political whereabouts of Irish history at this juncture. The move from the defended to undefended habitation is fully apparent and it strikes more of a relationship with the next generation of architectural styles built within the following century such as middle-sized houses like Beaulieu (1715) to the Palladian styled Castletown House (complete 1729). Internal conflict was not seen in Ireland until a century later and thus began a new epoch in architectural design and freedom to equal that of its European neighbours. The period between 1550 and 1700 was the most important period in the history of Ireland. It is important because of the change of power from Gaelic and Anglo-English to Protestant English and Scottish power. Through war and rebellion, lands were escheated to English and Scottish opportunists and this had a profound effect on Irish architectural history. Architectural styles were defined by the stability of the island and this is clear during the second half of the century when builders were erecting manors and adding details that were attracted from more fashionable parts of Europe and most importantly, without fear of being attacked. By the end of this period Ireland saw developments in industrialisation and city planning and would eventually see Dublin as Britain’s second biggest city. However, Gaelic chieftains that had held power for millennia were merely pawns in the strategic future of Ireland by the mid-17th century. Many had fled the country and many had their lands reduced to a fraction of their once vast estates. That said, in later centuries there were Gaelic families that showed their resilience to change such as the O’Connell’s of Derrynane. During the first half of the 17th century, the Gaelic Irish that could afford to build, matched the new English settlers in building advanced new styles and absorbed new designs and techniques in habitation. It was only after the 1641 Rebellion and the onslaught of Cromwell’s New Model Army in the 1650’s that saw Gaelic architectural revivalism subdued and the coming of a new age in the ownership of new design become apparent. These snippets are big enough for a Facebook read I think! The idea is to compare similar architectural styles and histories from roughly the same period between these islands. England, with the best-preserved architecture on these islands punches way above its weight in style, longevity and diversity for a bunch of reasons. However, some gems stood and still stand that are comparable in many ways that stood on each side of the Irish Sea. Have a read, I’ve put some scraps of interesting stuff for the neutral too! Internal structure is 16th century but what you see is 17th century alterations. An Elizabethan house with a later 17th century façade. Nunnington Hall was once owned by a Richard, 1st Viscount Preston. He was an interesting character as he was a member of the English Parliament in the 1680’s and he converted to Catholicism and backed the ousted King James II. He was one five men entrusted with running what was left of James’ government when he fled. Eventually, our Viscount was caught and brought to the Tower, stripped of his peerages and under a little torture spilled the beans on a few of his buddies! Below is Ireland’s architectural comparison to Nunnington Hall in Ballinsperrig House, County Cork. (www.17thcenturyirishhouses.com). Why is it black and white? Because it only survives in early photos such as this one above. It was built by the Cotter Family in the late 1680’s. An interesting fact about a member of the Cotter Family was that James Cotter (1630-1705) spent a lifetime tracking down the regicide killers of King Charles I (1600-1649) who got his head chopped off in 1649! He was a dedicated man and Cotter travelled to Lausanne, Switzerland to kill the big prized scalp of John Lisle in a church courtyard. That’s worth a visit! He was in charge of James II’s forces in Munster during the Williamite Wars (1690’s) and James himself even stayed in Ballinsperrig House a couple of times. The comparisons of the two families wasn’t just a dedication to Catholicism or Royalism but to the architectural influence between the two buildings. They both have flanking wings or more commonly known as projecting gables that step out enough to categorise it as a style. Ireland has a number of buildings from the 17th century with similar attributes and in England it is a rarity. Maurice Craig, arguably the authority on 17th century architecture believes that there is a correlation between the early ‘flanker’ Tower Houses (flanking towers on each of the four corners of a Tower House 1580’s – 1640’s) and the unfortified buildings or Manor Houses above. With some more research both houses may have family connections or even a direct influence on the style that was chosen.